This article is about the town near Leeds. For other uses, see Pudsey (disambiguation). 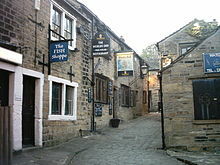 Pudsey is a market town in West Yorkshire, England. Once independent, it was incorporated into the City of Leeds metropolitan borough in 1974. It is located midway between Bradford city centre and Leeds city centre. Historically in the West Riding of Yorkshire, it has a population of 22,408. It also lends its name and sits in the local Leeds City Council ward of Pudsey and Pudsey parliamentary constituency. The place-name Pudsey is first recorded in 1086 in the Domesday Book as Podechesai(e). Its etymology is rather uncertain: it seems most likely to derive from a putative personal name *Pudoc and the word ēg meaning 'island' but here presumably referring metaphorically to an 'island' of good ground in moorland. Thus the name would mean 'Pudoc's island'. Other possibilities have been suggested, however. 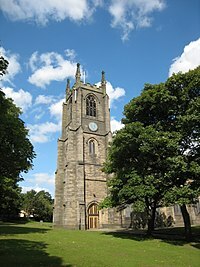 In the early sixth century the district was in the Kingdom of Elmet, which seems to have retained its Celtic character for perhaps as many as two centuries after other neighbouring kingdoms had adopted the cultural identity of the Angles. Around 1775 a cache of a 100 silver Roman coins, many predating the time of Julius Caesar, was found on Pudsey Common at a place known as "King Alfred's Camp" by Benjamin Scholfield of Pudsey. The town was famous in the 18th and 19th centuries for wool manufacture, and, from the 19th century, for cricket. Yorkshire and England cricketers Sir Len Hutton, Herbert Sutcliffe, Ray Illingworth and Matthew Hoggard all learned to play in Pudsey. A 19th century Yorkshire cricketer, John Tunnicliffe, was born in Lowtown. During the Industrial Revolution Pudsey was one of the most polluted areas of the UK due to its position in a slight valley between the two industrial cities of Leeds and Bradford. As a result, whichever way the wind blew Pudsey became covered in thick soot. The temperature inversion created by the valley led to the soot becoming trapped leading to dense smogs. This is believed to have led to jokes that pigeons in Pudsey Park flew backwards in order to keep the soot out of their eyes. Formerly within the wapentake of Morley and Calverley Parish, Pudsey Urban District was formed in 1894; it gained municipal borough status c1900. For many years, despite being joined to the Leeds conurbation, it avoided being made part of the County Borough of Leeds. In 1937 the Farsley and Calverley urban districts were added to Pudsey. 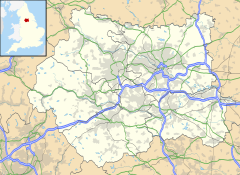 In 1974, under the Local Government Act 1972, it became part of the metropolitan borough of the City of Leeds. It sits in the Leeds City Council ward of Pudsey. Pudsey forms part of the Pudsey parliamentary constituency, along with Farsley, Calverley, Horsforth and Guiseley. The MP is Stuart Andrew. 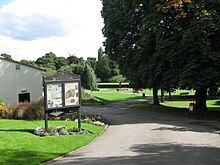 There are several recreational parks in Pudsey, the largest of which is Pudsey Park. There is also Queens Park where the Pudsey carnival is held once a year. Pudsey's market operates on Tuesday, Friday and Saturday and has recently been refurbished. Pudsey has also seen the introduction of a monthly farmers' market with a range of stalls selling meat, fish, dairy produce, organic fruit and vegetables, delicatessen and craft-ware. Pudsey town centre has many amenities including many high street chain stores and independent retailers, and like in other affluent areas there are several branches of banks and estate agents. Following the closure of Kwik Save supermarkets across the country, Pudsey's store was bought by Sainsbury's. Until the administration of the group, Pudsey had a Woolworths situated on Church Lane. It is now a B&M Home Bargains store. There are three secondary schools situated within or near Pudsey: Crawshaw Academy, Priesthorpe School and Pudsey Grangefield School. The latter has been rebuilt under an extensive redevelopment programme which sees a whole new state-of-the-art school building constructed adjacent to the current site. 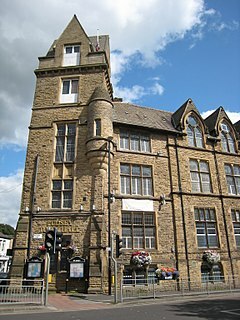 The old grammar school building facing Richardshaw Lane, which opened in 1911 and a prominent landmark of Pudsey, will unlike the rest of the old school buildings not be demolished due to its listed building status, but has since been converted into luxury flats. Pudsey's historic town hall benefits from a new, energy-efficient lighting project to highlight its most interesting features. The multi-coloured lights can be changed to offer 255 different scenes. During the Easter weekend 2009, the Pudsey Business Forum launched the Pudsey Shop Local campaign. The campaign is to encourage local residents to shop more in Pudsey Town Centre. As part of this campaign they have launched a directory of all local shops. There are many community groups working for the benefit of Pudsey, and their aim is simply to make their town a more attractive and interesting place to visit. One of these groups is Pudsey in Bloom, established in 2002. The community website This is Pudsey is run by local residents. Pudsey is also now home to an established Indian Sikh and minority Hindu and Muslim community. Pudsey's business community have recently introduced a Loyalty Scheme, aimed at local shoppers. The loyalty scheme, believed to be the first of its kind in the country, encourages shoppers to collect stamps from a number of local shops within the scheme. Once enough stamps are collected on a card it can be submitted for a monthly draw, where the winner receives vouchers that they can spend in any of the participating shops. Currently, 50 retailers take part in the scheme. There are several pubs and clubs in and around the town centre including the Butcher's Arms, The Manor Inn, the Mason's Arms, the Shamrock Inn (now closed), the Crossed Shuttle, the World's End pub, the Britannia pub and (outside the town centre) the Troydale Recreational Club. Pudsey also has a thriving Masonic community, there are several Lodges which meet at Pudsey Masonic Hall on Church Street. Locally these lodges support many activities within the local community. There is a small railway station known as New Pudsey railway station. 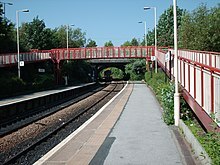 It is on the Caldervale Line between Leeds and Bradford Interchange and was built to replace Pudsey's two original stations — Pudsey Lowtown railway station and Pudsey Greenside railway station — which were both closed in 1964 by the Beeching Axe along with the GNR Pudsey Loop serving them. However, New Pudsey is situated over a mile away from the town centre making it somewhat impractical for commuters. especially as there only the rather infrequent bus service 14 linking the neighbourhood of the station with the town centre. However, the frequent No. 16 bus service between Pudsey and Farsley (continuing to Leeds) passes within 0.4 miles (0.64 km) of the station. The location of the station near to the junction of the main Leeds to Bradford road with the ring road provides easy access for those travelling to the station by car. There is a large car park adjacent to the station. Pudsey is now served by a number of First, Centrebus and Arriva bus services that run through to Leeds city centre and other areas of the city, Bradford and other surrounding towns. The 4 bus service runs regularly to the Leeds city centre from Highfield Green via the town centre and Swinnow. There is also a No.72 bus service that runs between Leeds and Bradford along Stanningley Town Street and Bradford Road, which is 10 minutes walk from Pudsey town centre. The No.508 bus service to Halifax is a further 5 minutes walk up Bradford Road, to near the junction with Old Road. Plans for a £2 million covered bus station in Pudsey, to replace the current array of individual bus stands, was given the go ahead. Work on the new bus station started in December 2009. it was officially opened on 29 November 2010. The Leeds-Pudsey tram route via Armley and Bramley was opened in the early 20th century; it was closed in 1938 and most of the infrastructure was removed, although roadworks on the central reservation of Stanningley Road uncovered some of the tracks in October 2005. Like the rest of West Leeds, Pudsey was never included in the original planning for the Leeds Supertram, subsequent plans such as that for trolley buses, a revised tram scheme or tram-trains have also failed to include West Leeds. The England cricket captain Sir Len Hutton was born in nearby Fulneck and was called "the man from Pudsey". Raymond Illingworth, another former England cricket captain, was born in Pudsey as was the England fast bowler Matthew Hoggard and the snooker star Danny Fowler. For over a hundred years the Yorkshire County Cricket Club had at least one player who came from the old Borough of Pudsey. The England opening batsman Herbert Sutcliffe attended Pudsey School and learnt his cricket with the Pudsey St Lawrence and Pudsey Britannia cricket clubs. In The Meaning of Liff a Pudsey is defined as "The curious-shaped flat wads of dough left on a kitchen table after someone has been cutting scones out of it." Toward the beginning of the Monty Python episode "You're No Fun Anymore", the two characters, Mr and Mrs Samuel Brainsample can be seen walking along the platform of New Pudsey railway station. Pudsey is also mentioned frequently in the Michael Palin TV series Ripping Yarns. The band The Dunwells originate in Pudsey. Pudsey has given its name to "Pudsey Bear", the mascot of the BBC's annual fundraising marathon Children in Need, as this was where Pudsey logo designer Joanna Lane's grandfather was mayor. ^ a b UK Census (2011). "Local Area Report – Pudsey Ward (as of 2011) (1237321094)". Nomis. Office for National Statistics. Retrieved 1 October 2018. ^ Pudsey in the Domesday Book. Retrieved 21 October 2017. ^ Victor Watts (ed. ), The Cambridge Dictionary of English Place-Names, Based on the Collections of the English Place-Name Society (Cambridge: Cambridge University Press, 2004), s.v. PUDSEY. ^ Pudsey was the last borough to receive its royal charter by Queen Victoria "Pudsey MB/UD". Retrieved 19 January 2019. ^ "UKPollingReport Election Guide 2010 » Pudsey". Retrieved 18 November 2016. ^ "BBC NEWS – Election 2010 – Pudsey". BBC News. ^ "Market reopens after £260,000 refit". Retrieved 18 November 2016. ^ "BBC - Leeds - Features - Pudsey's local stock market". Retrieved 18 November 2016. ^ "Sainsbury's at Kwik Save site". Yorkshire Evening Post. 3 October 2007. ^ "Hall trips the light fantastic". Retrieved 18 November 2016. ^ Wilkinson, Craig. "Shop in Pudsey - 5th May, 2011". Retrieved 18 November 2016. ^ "Pudsey In Bloom". Retrieved 18 November 2016. ^ "Homes for sale in former churches". Guardian Property. Retrieved 5 January 2019. ^ Pudsey was originally served by a short branch line running from Stanningley to Pudsey Greenside opened on 1 April 1878 by the Great Northern Railway. Fifteen years later the line was extended through Greenside Tunnel to Laisterdyke railway station, the original curve from Stanningley closed, and another (90°) curve to Bramley railway station opened forming the Pudsey Loop. The town had two stations on this Bramley-Laisterdyke-Bradford loop — Pudsey Lowtown and Pudsey Greenside — conveniently located at either end of the town centre, and both closed on 15 June 1964 as a result of the Beeching Axe. ^ "Bus timetables". Metro. Transport for West Yorkshire. 2016. ^ Beeton, Ian. "Pudsey Runners Website". Retrieved 18 November 2016. ^ The Meaning of Liff, by Douglas Adams & John Lloyd, Pan Books Ltd, 1983, ISBN 0-330-28121-6. ^ Potts, Lauren (14 November 2014). "Children in Need: Pudsey Bear's path from mascot to national treasure". BBC News. Retrieved 14 November 2014. Wikimedia Commons has media related to Pudsey. "Pudsey" . Encyclopædia Britannica. 22 (11th ed.). 1911. Pudsey.com Pudsey Online Community Website.